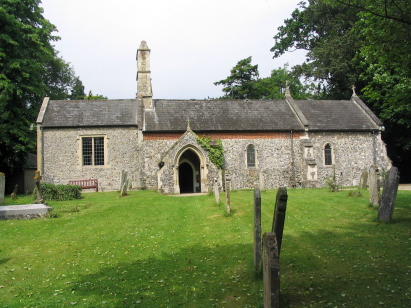 The parish of Brundall lies in eastern Norfolk about 5 miles east of the city of Norwich. The parish is a riverside one on the north bank of the River Yare and very low lying, barely 15 metres above sea level. Originally a rather quiet and small settlement Brundall has grown rapidly in modern times as commuters have sought to escape the confines of the city and now large estates of bungalows and prestige homes dot the landscape of the parish. It is difficult to remember that this originally was a parish of less than 100 folk engaged in agriculture and exploitation of the river flood plains and their reed beds. St Lawrence's church is sited down a narrow lane off to the south from Brundall's main road. The church is lacking a tower and apparently has never had one. 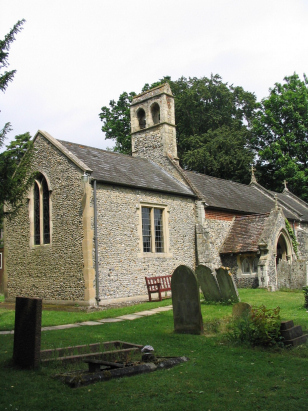 Most of the building dates from the late 13th century, a fairly typical date for a Norfolk church, but there are later additions in particular the late 19th century north aisle which was added when the church was extensively restored. The church almost fills its site from east to west with tall mature trees close by to both east and west ends, the graveyard is thus well sheltered and peaceful despite the busy main road close by. A single standard 800-entry register book covers the period of the transcript and indeed continued in use up to the end of the 20th century such was the small population. This register is filmed on Microfilm MF1679 in the collection of the Norfolk Record Office which was used to prepare this transcript. The film is a modern one benefiting from the current much improved image quality. The register has been subject to some damage in the past and the handwriting varies extensively despite the few entries but despite these factors this proved to be a straightforward transcript to prepare and it is to be hoped few errors will have crept in.